As a result of her dedication to the ‘Pursuit of Excellence,’ Sue has ranked at the top of both local and national markets for the majority of her career. 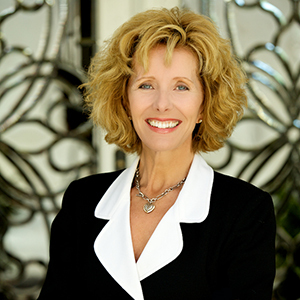 Profiled in San Diego Magazine’s ‘Women Who Move the City’, Sue specializes in residential real estate in North San Diego County, with an emphasis on Rancho Santa Fe, Carmel Valley, Del Mar and La Jolla. She has excelled by making her clients’ goals and needs her top priority. Originally from Chicago, Sue has been a full-time Realtor in San Diego since 1999, all while renovating and investing in residential properties for her own portfolio. With a successful background in sales for the likes of J&J and IBM, Sue was trained to be a tough negotiator with a keen sense of customer service; attributes that have served her well throughout her sales career. Keeping on top of a dynamic and fast paced real estate market, Sue constantly keeps informed about the state of the local housing market and the national economy, as well as the ever-changing real estate laws and contracts. Committed to providing exceptional service, Sue completed an advanced series of coursework to earn two prestigious designations: Senior Real Estate Specialist (SRS) and Graduate Realtor Institute (GRI). Sue believes her association with Berkshire Hathaway HomeServices brings added value to her clients. With the power of the brokerage’s advanced technology, expansive marketing presence, and worldwide name recognition, her clients enjoy exceptional representation. A passionate gardener and animal lover, Sue is a member of the San Diego Zoological Society and Friends of The San Dieguito Valley. Besides serving on the board of Fresh Start Surgical Gifts for Children, she also supports the Helen Woodward Animal Center, Childhelp, Big Sisters of San Diego, the Rancho Santa Fe Literary Guild and The San Diego River Park. Sue has lived in the Del Mar/Rancho Santa Fe area since 1980. Sharing her home is the ghost of her spoiled little dog Cobi, a Coton de Tulear. Together they are both patiently waiting for their new puppy to find them. Sue can be reached at 858-353-3242 or Sue@SueCarr.com. Visit Sue’s website at www.SueCarr.com for the latest real estate listings, trends, and statistics. Cul-de-sac location, on one of the largest lots! Luxuriously appointed and thoughtfully planned out for flexible living: all bedrooms are ensuite, 1st flr Jr. master w/ primary master up, cozy theater (w/closet & full bath- could be add. bedrm), richly paneled library with french doors to sunny patio, spectacular resort-style backyard w/waterfall, beach entry pool/spa-all visible from living areas. Cabana w/BBQ kitchen, fireplace, bathroom and putting green. Private, Gate guarded, secure, close to all! Panoramic ocean views! Sitting just north of the Plaza in Old Del Mar, Deems & Lewis designed home with 180′ ocean views from multipe rooms and a sweet little detached 2 bdrm guest house @ 500sq.ft! (rents out for $2200 per month!) Newly renovated kitchen with SS appliances and granite counter tops! Wrap around decks to take in the killer ocean views and dazzling sunsets, plus a private walking easement that allows for easy beach access. Original owner over 37 years- a rare offering! 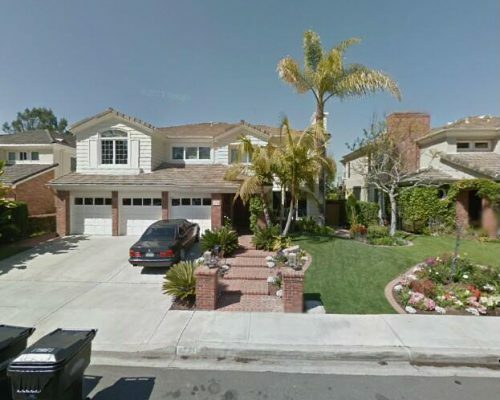 SOLD $2,280,000 Represented both Buyer and Seller. A rare offering within the gates of Rancho Santa Fe Lakes, this custom home sits high up on a premier lot with no homes behind. Meticulously maintained with one bed/bath down for a total of 5 bedrooms plus two more optional. Home enjoys abundant sunlight and finest finishes. Private and lushly landscaped, the backyard is your own private resort: pool and spa w/ waterfall, slide, BBQ and palapa bar with sandy surround, fireplace and large grassy area for lawn games or maybe a playhouse? Paradise! Fairway views!!! Newly built in 2013 and used primarily as a second home, meticulously cared for and maintained with master and guest room on first floor, two generous ensuite bedrooms up, and a separate detached casita with bath. Bifold glass doors run length of kit/family room and open to covered loggia where you will want to just park yourself in front of the fireplace! Sensible size pool and separate spa add to the perfection. High end finishes though out in gate guarded RSF Farms! Love it! 4710 Plummer Ct This Single-Family Home located at 4710 Plummer Court, San Diego CA sold on Nov 10, 2008. 4710 Plummer Ct has 6 beds, 4 ½ baths, and approximately 4,034 square feet. The property has a lot size of 8,407 sqft and was built in 1993. The average listing price for similar homes for sale is $1,530,495 and the average sales price for similar recently sold homes is $1,570,483. 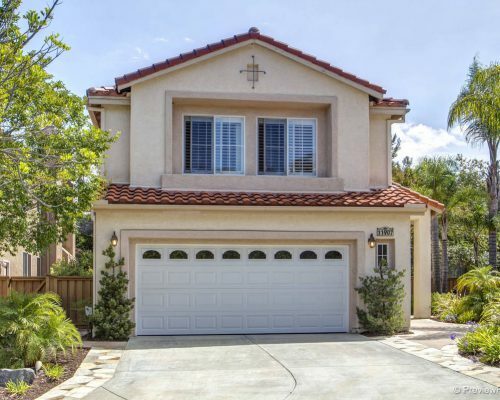 4710 Plummer Ct is in the Carmel Valley neighborhood in San Diego, CA. The average price per square foot for homes for sale in Carmel Valley is $411. Rare opportunity to own a Huntington Heights Plan 2, with all the extras! Spectacular Panoramic back country, canyon views highlight this quiet cul de sac location on a large oversized lot with gardens, solar heated pool/spa, covered dining area with outdoor lighted fan and firepit for the ultimate private entertaining experience. Custom features including limestone, maple floors, granite counters, crown molding & window coverings. Award winning schools, close to beaches, schools and freeways. Won’t Last!!!! Chefs kitchen with stainless Viking and Bosch appliances. Built in full size side by side refrigerator/freezer. Romantic master suite with FP and remodeled luxurious bath retreat, lg. walk in closet. Extra room can be used as game room or office. 1 bedroom and bath on mail level. Beautiful home in Carmel Country Highlands in Carmel Valley. Large open floor plan. 3 Car attached garage. 1 bed and bath on first level. Granite counters in kitchen. Upgraded tile and carpet throughout. Great Master suite, with Fireplace and retreat or optional 5th bedroom. Balcony off Master with west breeze and canyon view. Nice backyard with pool, Jacuzzi and BBQ. Excellent School district, DMUSD. Sage Canyon Elementary CV Middle School and TPHS or CCA High Schools. NEW CONSTRUCTION by Davidson Communities – Arista at The Crosby. This stunning home features a downstairs Master Bedroom! Buyer can still customize finishes throughout! Photos are of Model Home. 6901 Corte Spagna With picturesque beauty echoing the Northern Italian countryside, The Bridges of Rancho Santa Fe is arguably one of Southern California’s most coveted addresses. Located on an elevated site at the end of a cul-de-sac, this Plan 3 Bridges Villa features a rare combination of peacefulness and tranquility with a coveted south-western orientation. The redesigned main floor Casita has been joined to the main residence, creating a superb 2 bedroom, 2 bath suite. The master bedroom, dedicated office and public spaces have easy access to the sun-drenched outdoors via multiple sets of French doo…rs. 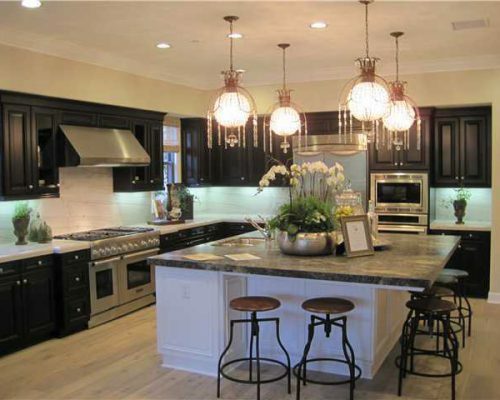 A well-appointed kitchen, located at the heart of the home, has easy access to casual or formal dining, indoors or out. Upstairs, an additional suite can be used as a dedicated media room, game room or 4th bedroom. 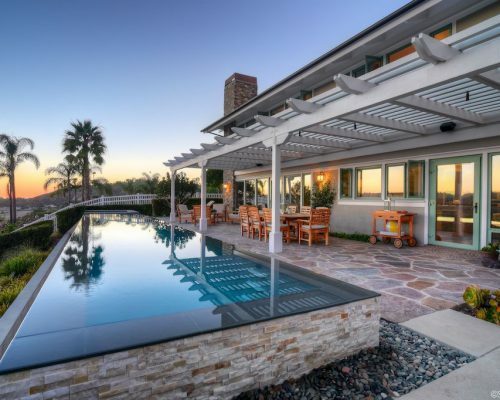 Outdoors, the covered loggia, fireplace and custom spa, surrounded by lush, flowering plants, will provide hours of entertainment or serenity in the ideal, year-round San Diego climate. 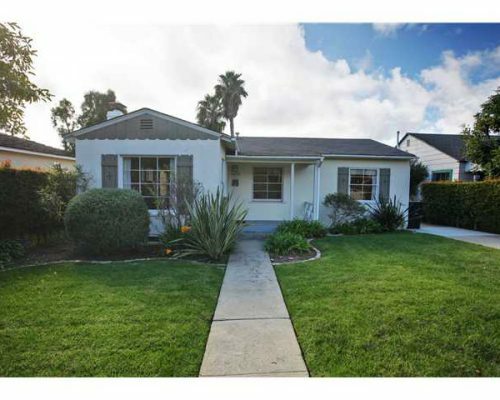 Amazing property features a charming, remodeled 1940’s 3BR home in the heart of Bird Rock. Situated on one it’s most desired streets. Boasting a large west facing, beautifully landscaped & sun-drenched yard – lot is 5,500 square feet. Features include ocean views, an upgraded kitchen, hardwood floors, and an additional private detached 1BR/1BA cottage perfect for a nanny, extended family or a wonderful office. Riviera Del Mar! Sit down ocean views from every major room! Wonderful single story with designer paint, granite in kitchen with stainless steel appliances, all new double paned windows and doors throughout! Close to Del Mar Village, beaches, shopping and best schools. Great family home, investment, or that beach retreat you’ve been waiting for! Now is the time to buy!!! 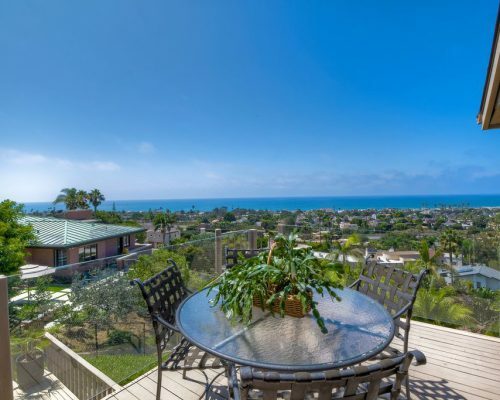 Experience magnificent ocean and lagoon views from every level in this architectural Del Mar Terrace gem! Designed by William Dumka, this 3BD/2.5BA property features an open floor plan that flows effortlessly through the living room, dining room, gourmet kitchen, and breakfast area. The inviting exterior is the perfect artistic combination of concrete and red cedar wood. 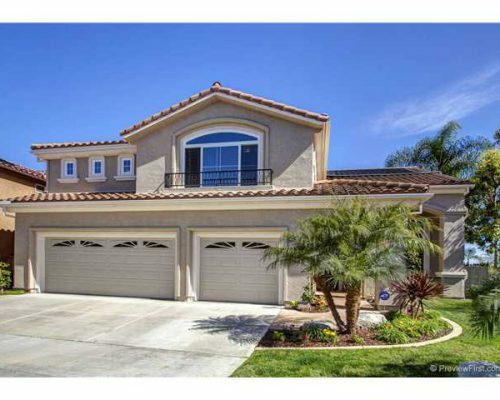 Carlsbad home on Cul-De-Sac w/ granite kitchen, pantry, gas SS double ovens, large master, 6 bedrooms + loft PC area. Brick patio w/ arbors, built-in hot tub, BBQ/kitchen, water features. 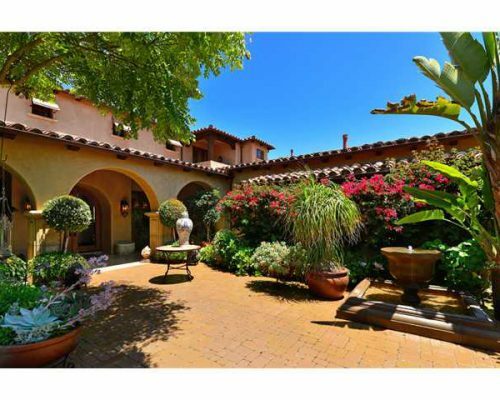 Built in 2004, 3495 SF w/ hardwood, stone tile & Berber carpeting. New paint w/ custom neutral colors, crown molding, shutters throughout. Many high end upgrades. Downstairs bedroom w/ full bath, 3 car garage. 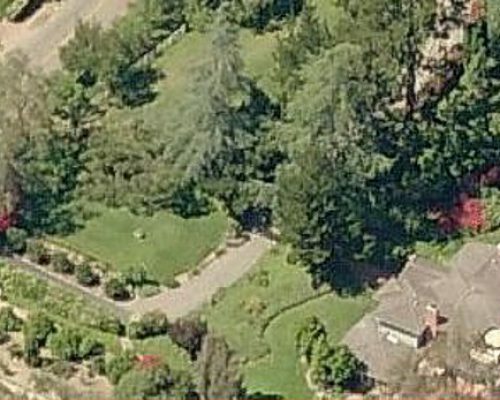 Close to I-5, beach, restaurants, shopping. 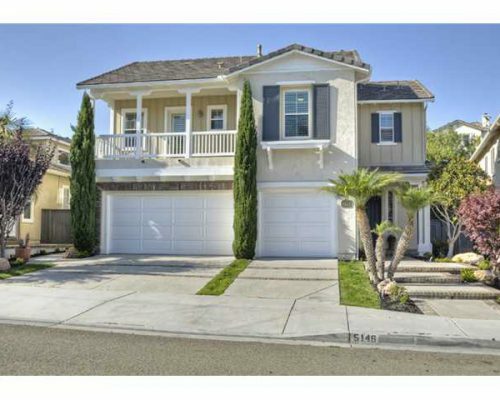 Excellent Carlsbad Schools w/ NEW Sage Creek High School or Cbd HS option. 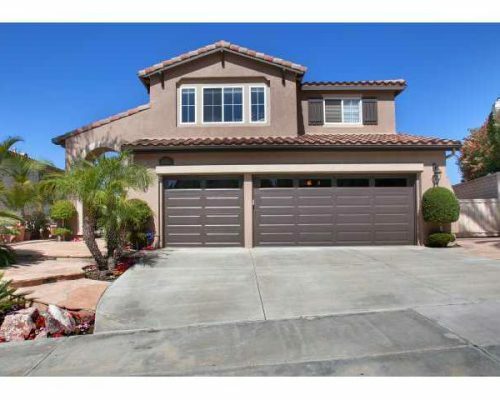 Gorgeous Carlsbad home on Cul-De-Sac in family friendly neighborhood. Featuring gourmet kitchen with granite, pantry, gas SS double ovens, spacious living areas, large master, 6 bedrooms + loft/office area. Professionally landscaped Brick patio with arbors, built-in BBQ/kitchen, water features and spa in back yard. 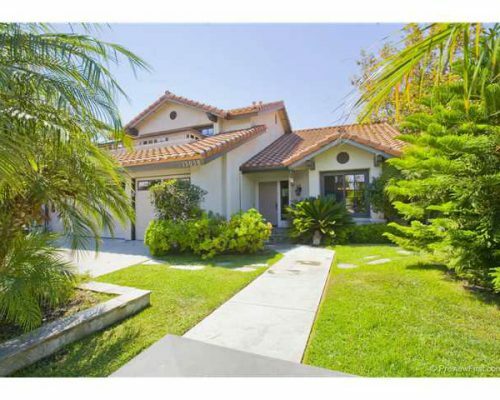 Built in 2004, 3495 SF with hardwood floors, beautiful stone tile and upgraded Berber carpeting. Completely new paint with custom neutral colors, crown molding, shutters throughout, many high end upgrades. Cedar lined closets. Downstairs bedroom with full bath, 3 car garage. Close to I-5, beach, restaurants, shopping. 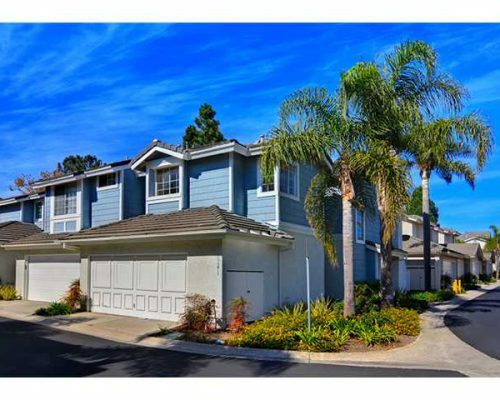 HOA only $116mo, MR $882 yr, Excellent Carlsbad Schools with the NEW Sage Creek High School or Carlsbad High School option. A coastal dream come true. Primo location on end of cul de sac! Just steps way from schools and shops, you can’t beat this location! Big, open kitchen/family room looks out to solar heated saltwater pool and spa. Grassy side yard provides shade and room for play. Convenient master on first level with sliding doors leading to pool. Been loved and lived in! A little paint, some new carpet, and we’ll be ready to rock and roll! At this price, it’s a steal! 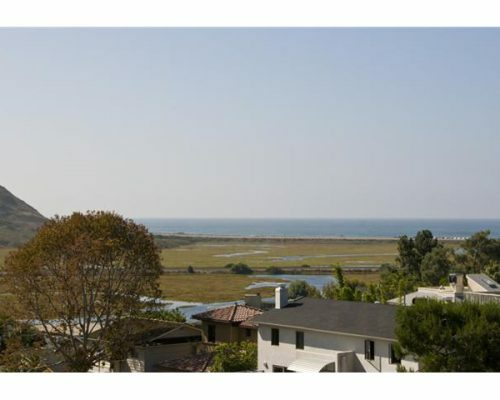 Quiet location, sitting high above neighboring homes with lots of open space & breath taking panoramic views. Beautiful professionally landscaped front & backyard with numerous palms, birds of paradise & flowering bushes. Recently re-plastered pool & spa, tremendous patio area & additional parking area on the side. 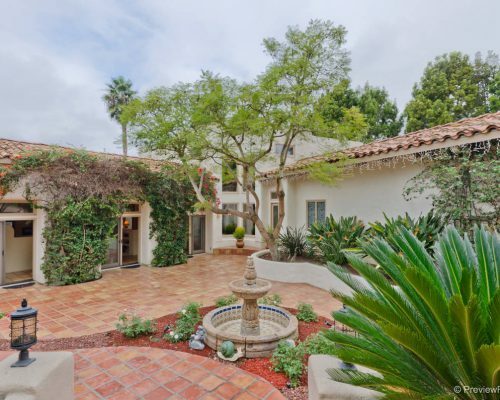 Pleasant front courtyard with wonderful flagstone, palms & koi pond. Interior and exterior of home recently painted. Large Kitchen with black granite tile counters, white Euro-style cabinets, all new stainless steel appliances, large center island, large walk-in pantry & serving door to dining room. Family Room with gorgeous hardwood flooring and granite-faced fireplace, 2-inch wood blinds, ceiling fan & wonderful views. 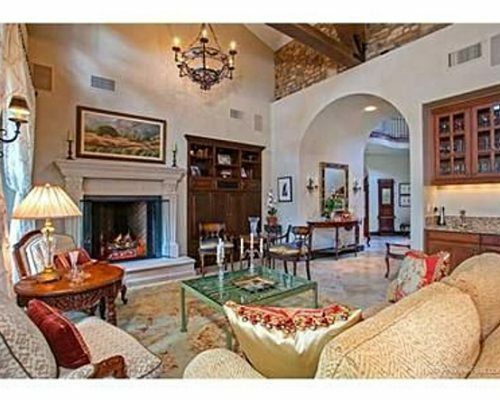 Tremendous formal Living Room with granite-faced fireplace, 2-story volume ceilings & tons of natural light. Dining Room has recessed hutch area, decorative columns and tile flooring. Huge Master Suite has granite three-sided fireplace, balcony with awesome views & pleasant breezes, large walk-in closets, dual vanity areas, oversize tub & separate shower. 3 kids’ bedrooms with private bath and Jack’n’Jill bathroom. Large 5th Bedroom with full bath located downstairs. Bonus Room upstairs is excellent as an office, second family room, bedroom, crafts room, etc. Laundry Room has deep sink and cabinets. Elegant 18″ tile flooring with inlaid granite at foyer, hallway, dining and laundry room. Stylish 5-1/2″ molding downstairs. Upgraded carpet in living room, bedrooms, and upstairs hallway. Recessed art niche. Spiral staircase. 4-Car Garage(one tandem) with tons of overhead storage. Award-Winning PUSD – Refrigerator, washer, dryer, canopy, and built-in desk in upstairs family room convey. Koi fish, garage cabinets, all office furniture including office overhead storage cabinets do not convey. 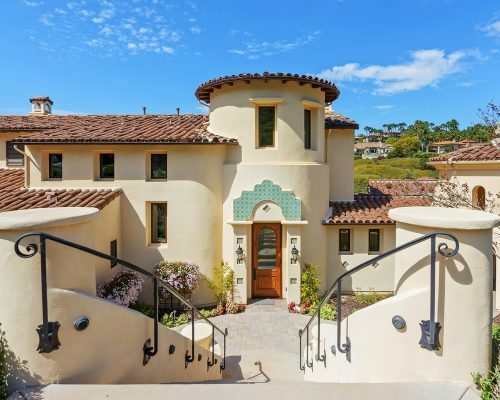 This custom home built by Michael Gregory Builders offers the unique opportunity to live above the fairways of a championship golf course in the prestigious community of Rancho Santa Fe Farms. Single story, offering 5,521 square foot is designed to maximize indoor -outdoor living. Formal living and dining room, gourmet kitchen opens onto expansive family room, generous office, spacious secondary bedrooms and master suite. Covered loggia, pool and spa are just a few of the outdoor amenities offered. 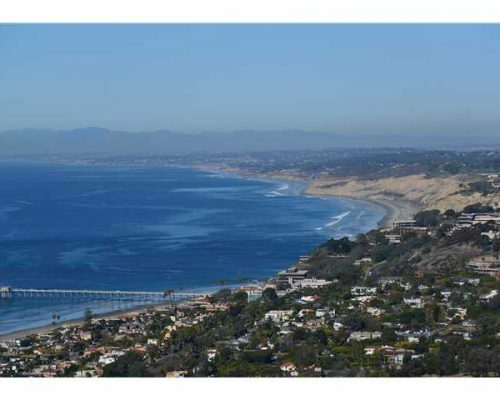 If you are looking for new constuction, single level with great La Jolla views this home is a must see! West side Covenant! Location cannot be beat! Easy access to trails, Village, beaches and freeways. Gently sloping lot offers varied options for placement of home and any other structures. 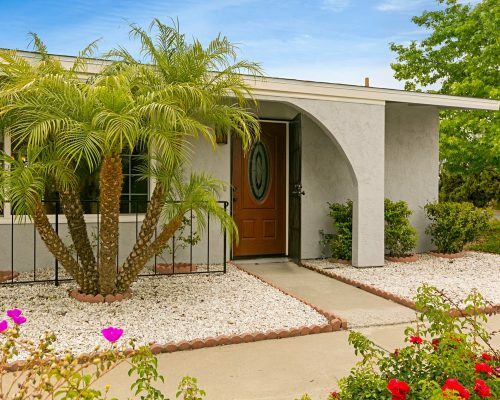 Very private with pastoral approach on one of the Ranch’s best streets. Keeping horses MAY be an option. Please do not access property without listing agent. 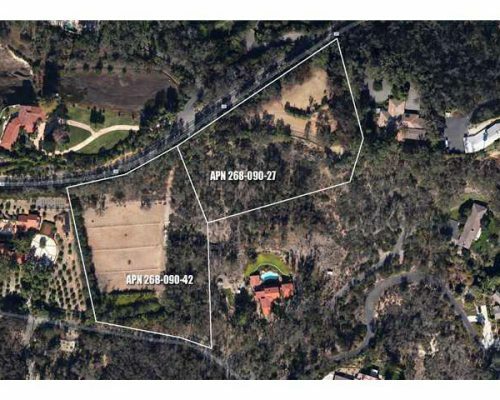 5151 Linea Del Cielo This Lot/Land located at 5151 Linea Del Cielo, Rancho Santa Fe CA is currently for sale and has been listed on Trulia for 53 days. 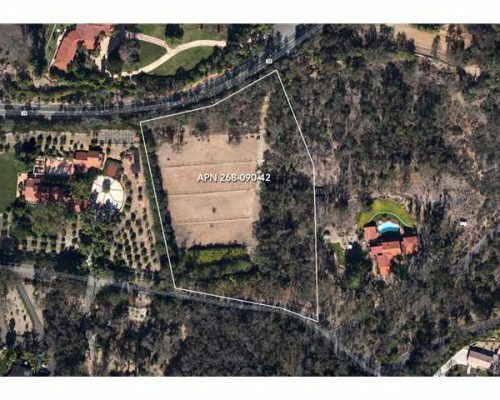 This property is listed by Berkshire Hathaway HomeServices California Properties for $2,900,000. The property has a lot size of 5.72 acres. 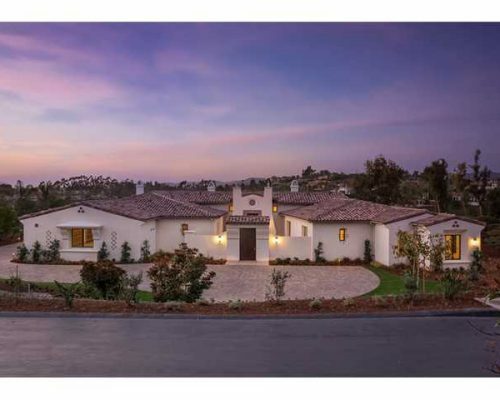 5151 Linea Del Cielo is in the 92091 ZIP code in Rancho Santa Fe, CA. Stunning custom home in exclusive gate guarded Rancho Pacifica. Sitting on just over 1/2 acre at the very end of the cul de sac, this location affords maximum privacy and quiet. At just over 7200 sq.ft., it is masterfully planned for flexible living. All five bedrooms have full baths with a wonderfully large first floor bedroom that could be used as another master, if needed. Another ground floor bedroom with full bath and closet is cleverly repurposed as a theatre but could definitely do double duty as a guest room! The richly appointed library is a special sanctuary unto itself, with french doors leading out to a tranquil, sun warmed patio. On cooler nights, the large fireplace warms the whole room and provides a comforting retreat. Cascading waterfall and beach entry pool with spa serves as your own private oasis. Completing the resort package is the putting green, pool dining cabana with outdoor kitchen, fireplace and changing room with bath. 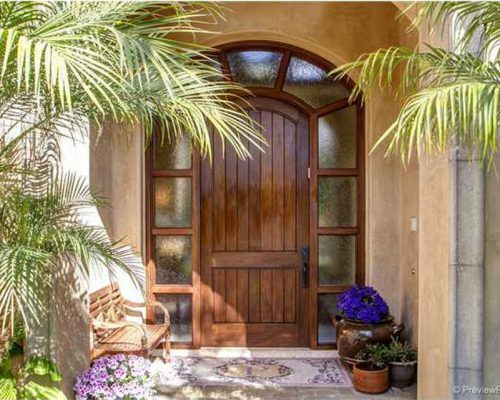 Gate guarded and secure, it offers the best combination of what the Ranch and coast offer; convenient location, excellent school district and close to all. Stately…refined….perfect! 8171 Lazy River Rd This Single-Family Home located at 8171 Lazy River Road, San Diego CA is currently for sale and has been listed on Trulia for 92 days. 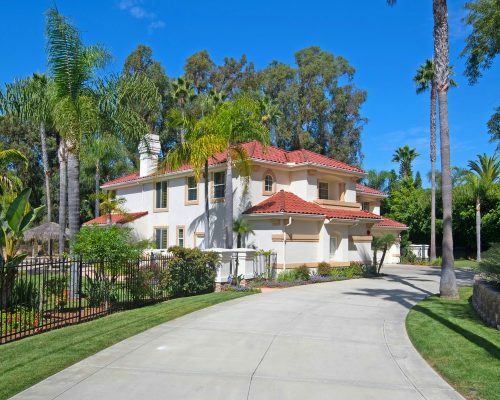 This property is listed by Berkshire Hathaway HomeServices California Properties for $1,180,000. 8171 Lazy River Rd has 5 beds, 5 baths, and approximately 3,585 square feet. The price per square foot is $329. The property was built in 2012. 8171 Lazy River Rd is in the 92127 ZIP code in San Diego, CA. Nestled on just over one acre, this charming hacienda backs to preserve and creates a private and quiet sanctuary. Kiva fireplaces, detailed ceilings, wrought iron accents, covered loggia- so inviting! Guest house is just steps away and could be enclosed to atttach main house and convert to additional bedrms. Abundance of French doors and windows to enjoy views of garden. $40K spent on plans to expand and will convey with purchase. 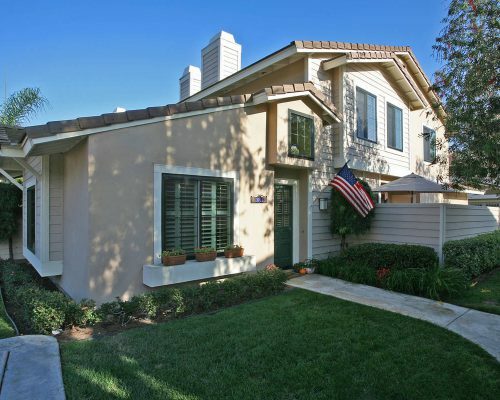 Perfect home to downsize or move into the fabulous gated Fairbanks Ranch- 24hr. guard gate, equestrian center, trails, clubhouse. A great investment and great buy at this price! Coveted end of cul de sac location with a beautiful, huge backyard, terraced and lushly landscaped. Plenty of room for a pool. Full bed/ba on first flr. Shows like model! Rich wood floors, large picture windows. Custom media center, whole house RO water filter and softener. Closet organizers, epoxy garage floor, whole house fan! NO Mello roos! Meticulously maintained end unit in Coral Cove! Shows like a model! Extensively updated – new windows and doors, new floors-both tile and hardwood! 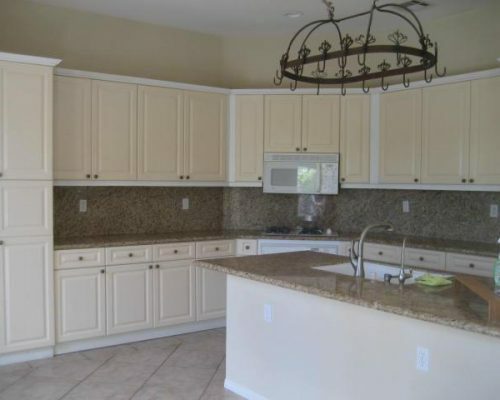 New appliances, A/C, designer paints, new patio tiles, plants, shutters. Surround-sound w/speakers. Pvt walled patio off family room. Lushly planted complex with meandering walkways leading to resort-like pool and tennis courts makes for a relaxing and peaceful environment. 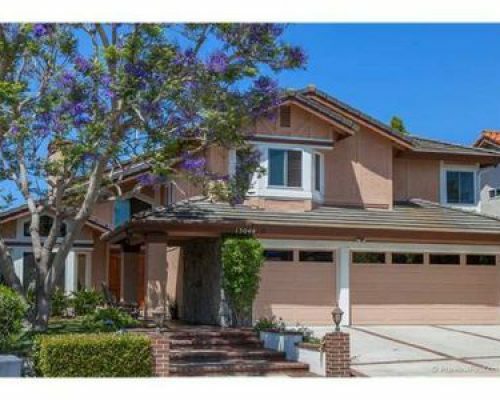 Close to all:shopping, schools, beach, bike path, freeways! Open, livable floor plan! Coveted end unit provides maximum sunlight and privacy-lives like a detached home. Newly upgrade travertine floors adds to easy care. Delightful ‘secret garden’ brings outdoors in. Front door placement adds to feelings of peace and safety-attached garage a supreme convenience. Additional parking just steps away. Close to all: schools, shopping, freeways, beaches, parks- a fabulus find!